Pumpkin contains insoluble fiber which can help firm up a dog's stool. If your pet has soft, mushy poop, feeding him a little plain canned pumpkin is a very natural remedy that should help fix the problem. 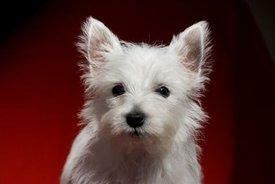 I have an eight-month-old Westie. Ever since I acquired him four months ago, he has passed a very soft stool. After he was treated twice for Giardia, his stool was free of infestation. Still, he continues to pass frequent very soft stools. Otherwise, he appears very healthy and super active. Any accounting for the persistence of frequent and soft stools? Giardia can be persistent, so it might be a good idea to have his stool checked one more time. That said, some dogs do naturally have softer stools than others. If everything checks out okay with your vet, you can address the problem through your dog's diet. Canned pumpkin and sweet potatoes are both great sources of insoluable fiber. By adding just a couple spoonfuls to your dog's dinner every day, you can increase his fiber intake and firm up those stools a bit. Be sure that you use plain, not sweetened pumpkin or potatoes. The plain foods have plenty of natural sweetness, and you don't want the extra ingredients contained in the mixes. I hope you find these suggestions helpful. Thanks for your question.